Display 3 different pamphlets in the same holder. Black gloss acrylic sides present a classy look. 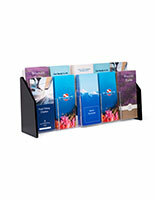 Front panels are clear to focus a customer's attention onto the brochures. 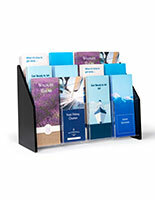 These office brochure holders are literature racks with 3 pockets for displaying pamphlets. Use these flyer displays to showcase similar information. 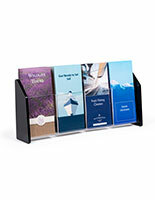 Do you need new brochure holders for a bank or credit union? 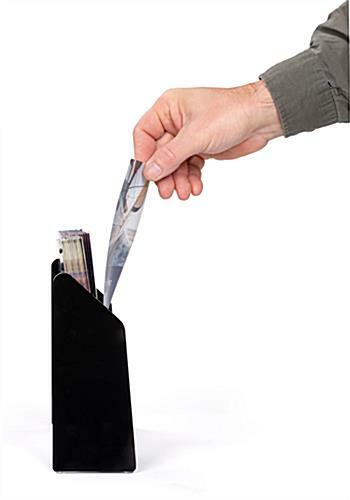 These literature racks are great for holding credit card applications as well as other bank rate information. 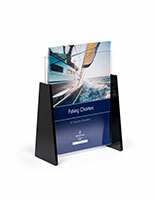 These flyer displays, office brochure holders are suitable for any location where information is exchanged or gathered. 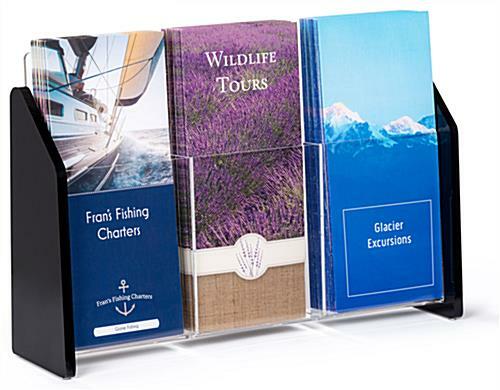 For example, these literature racks, also known as flyer displays, could be found at an informational table at a highway rest station, on a hotel concierge desk, at many tourist attractions or at both rental car and travel agencies. 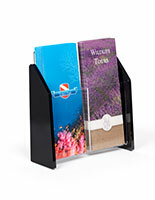 Hotels and travel agencies often use these brochure holders to display pamphlets for local attractions or popular getaway destinations. 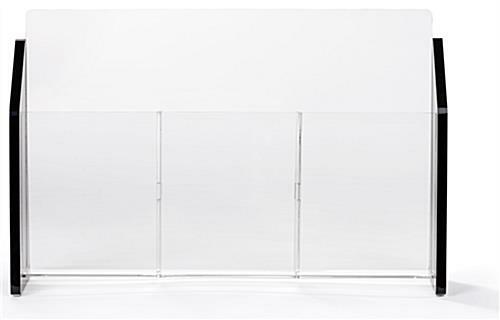 Clearly these acrylic units can be used in almost any atmosphere or setting! 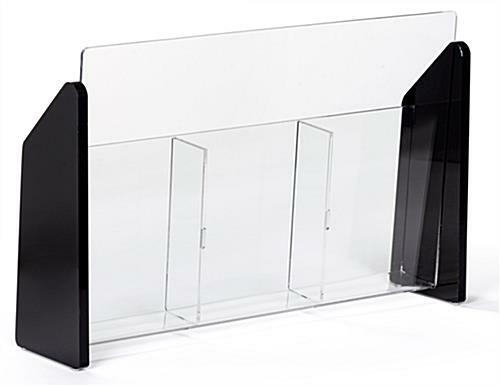 These literature displays are brochure holders, made of a durable acrylic. These lightweight units are built to last and can withstand many years of use. 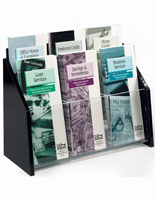 With the front and divider panels clear, these flyer racks, brochure holders showcase each pamphlet well by not taking away from or blocking the graphics. Viewers can see the entire front of the displayed literature without having to remove it from the pocket. 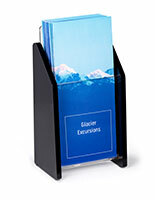 These brochure holders, such as the 2-pocket racks and 1-pocket displays, have two 3/8" thick, black gloss acrylic end caps to add a stylish appearance. The black sides offer a nice contrast to the clear front and rear panels. 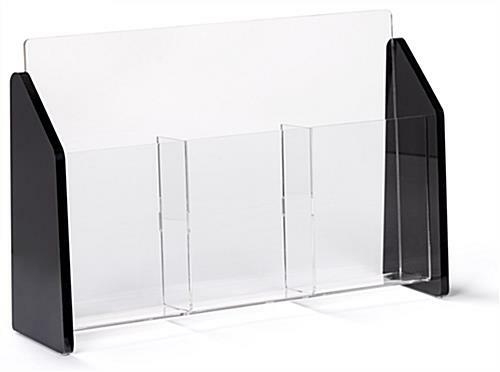 These acrylic brochure holders will be a great addition to any countertop area!